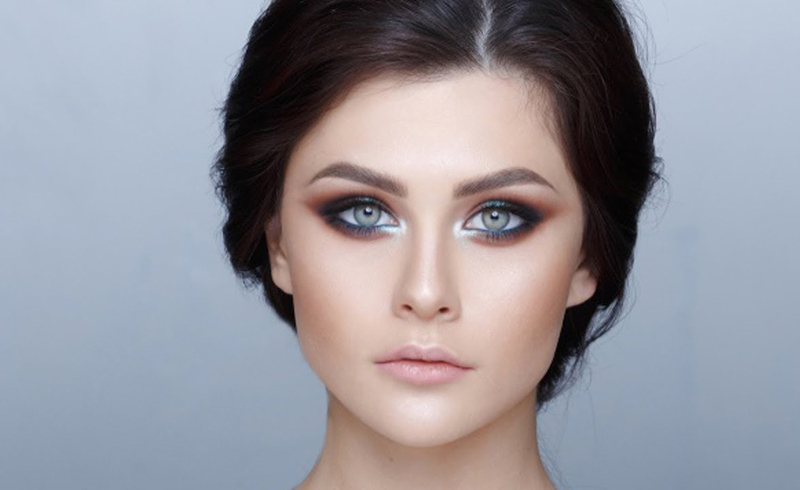 Whether you subscribe to the "new year, new you" notion or are just curious to know more about the makeup trends you'll be seeing in 2019, you've come to the right place. But before we embrace the new, let's first reminisce about the "old." Some wild and wonderful trends — many of which you may have tried — filled the year. As The List reported, edgy looks were a prominent feature of 2018. Heavy winged eyeliner called "Cleopatra liner" and bright orange and deep blue eyeshadows were fun to experiment with. Although Rihanna came out with her incredibly successful line of cosmetics, Fenty Beauty, the year prior, 2018 was certainly the brand's "It" year. This was due, in part, by the makeup's frequent appearances at the spring 2018 fashion shows. Crystal-infused products, warm red highlighters, and bespoke mascaras were also trending throughout the year. You may think you've seen it all when it comes to makeup, but 2019 has quite a few tricks up its sleeve. Here are the trends experts say you'll want to try. It's time, everyone. Lip gloss is finally making its return to the makeup scene. However, the gloss of 2019 will be a vastly improved version compared to the kinds you may remember. "Brands have started to up their gloss game with non-sticky versions [thus] avoiding a hair/lipgloss disaster," professional makeup artist Natalie Kate revealed to The List. We can breathe a collective sigh of relief for that. New York City-based makeup artist Margina Dennis also foresees the use of non-sticky gloss throughout 2019. "People are ready for hydrated lips," she told The List. Ain't that the truth. The expert continued, saying, "I think we will see treatment glosses with ingredients like plum oil and hyaluronic acid and also glosses with a gel texture with longer readability." For those who are beyond ready to give up their moisture-sucking, matte lipsticks, this should certainly come as good news. 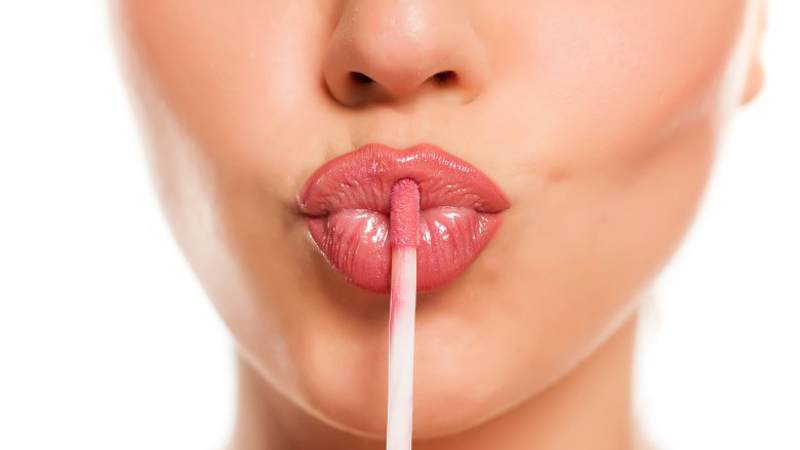 It's not just lip glosses that are going to rely on hyaluronic acid in 2019. Makeup artist Margina Dennis told The List that she expects to see even "more products containing hyaluronic acid." 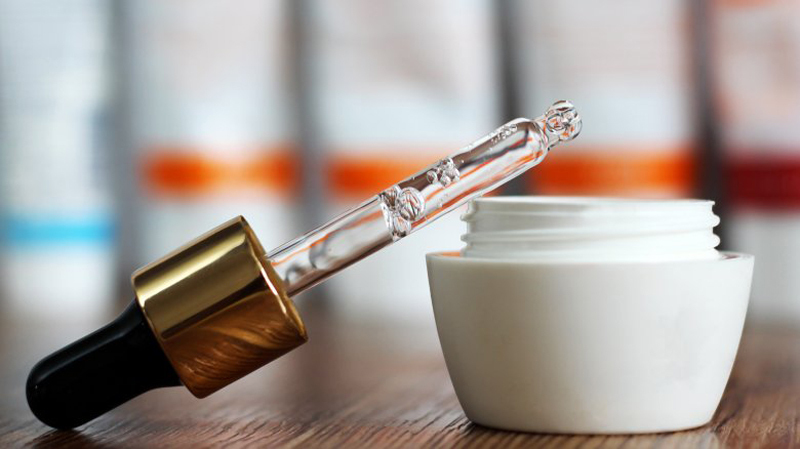 The thought of putting any acid-based product on your skin might sound suspect, but, if you can look beyond the name, you'll find this ingredient is one well worth trying. For one thing, hyaluronic acid is much less intimidating when you take into account that it naturally occurs in the body. "HA (hyaluronic acid) is critical in maintaining skin hydration," Maryam Zamani, an "Oculoplastic Surgeon and Aesthetic Doctor," told Elle. She further explained that it "helps to hydrate the skin and maintain this hydration as a humectant." According to the doctor, it can actually "hold up to 1,000 times its weight in water." There's no doubt that hydration is going to be a huge part of both skin care and makeup routines in 2019. Not everyone enjoys spending tons of time applying their makeup each and every day. Anything that can simplify that daily routine is going to be a welcome change. 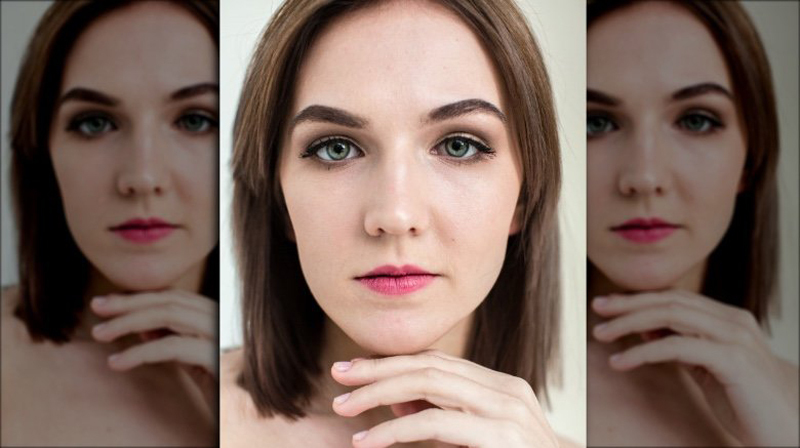 Thankfully, makeup artist, airbrush specialist, and owner of Beauty Asylum in North Carolina, Jessica Kendall, confirmed to The List that the "no makeup look" is going to be a stunning trend in 2019 — and maybe even beyond. "This is a trend I am hoping to see stick around a while," she revealed. Mmhmm. She noted, "It's a great change from the ultra sculpted/contoured cheeks." Instead of "chiseling" out those cheekbones and defining your jawline with powder, the makeup guru said this more natural trend focuses on "a light airy look" that is both "refreshing and feminine." Contouring was fun, sure, but, we can probably all agree that it's time to embrace something new — preferably something that requires fewer brushes and a lot less time. 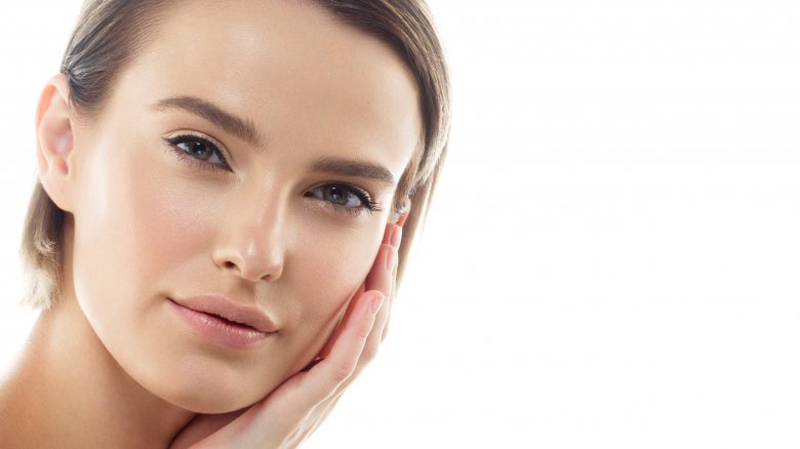 Although glossy skin started becoming popular in 2018, it's being taken to a whole new level in 2019. Introducing: glass skin. This trend actually originated in Korea, but, thanks to the Internet, the technique has caught on in the United States as well. If it sounds a little confusing, don't worry. You're not actually putting glass on — or in (eek!) — your skin. Instead, glass simply refers to what your skin will look like once you're done. When speaking to Insider, beauty blogger Joan Kim explained glass skin as essentially a "clear, poreless, and dewy" finish. "Glass skin is my absolute favorite trend," cinematic makeup artist Ulla Gaudin, who has worked with the likes of Laura Dern and Kate Winslet, told The List. "Bye bye heavy contours and highlights! Thank goodness!" Yes, 2019 may just be the year that we put the contouring trend behind us and embrace what Gaudin called "back to basics." Just because contouring is on its way out, that doesn't mean all bold looks will go with it. "A bold statement lip is coming back, paired with minimal natural makeup," makeup artist Natalie Kate told The List. She explained, "This one is perfect for revamping your everyday makeup without too much hard work." Although a deep red shade may come to mind when you think of a statement lip color, much brighter colors are in store for 2019. The beauty expert revealed that these shades — which range from bold corals to summer peaches, to even neon pinks — are going to dominate in 2019. While you may have already experimented with some of these fun colors, pairing them with the "no makeup" foundation look or glass skin enables you to create a really fun — and unexpected — juxtaposition. Plus, as Natalie Kate revealed, it's not a trend that requires a ton of effort. And the easier the trend, the more likely we all are to give it a go. If you're not on board with the bold lip trend as of yet, there is another way to inject some color into your 2019 makeup routine. Jessica Kendall — makeup artist, airbrush specialist, and owner of Beauty Asylum in North Carolina — clued us in on a fun new trend she calls "vibrant mascara." Although she admitted to The List that she doesn't see this trend sticking around forever, she said that "everyone is intrigued to try this at least once" — including herself. These brightly colored mascaras are sold in many hues, but you'll still want to choose carefully. "Pink, red, or orange would not accentuate the eyes in a way you hope; these shades definitely know how to bring out the red in your eyes," Kendall cautioned. That's no good! If you're looking for a good color to pair with your everyday beauty routine, the expert advised sticking to cool tones instead. If you're a glitter fanatic, 2019 is going to be your year. Celebrity makeup artist Mary Irwin told The List that the shimmery substance is going to be everywhere. "From more subtle metallics, to outright chunks of glitter, this is one trend you can't ignore," she revealed. If you can't beat 'em, join 'em, right? In January 2019, Glamour revealed their picks for the best new makeup on the market. Lo and behold, glitter products made the list. "I don't know if it's the leftover holiday spirit or my newfound love of going out, but I have been very into glitter eyeshadow lately," Bella Cacciatore, the magazine's beauty assistant, shared. A subtle glitter-based highlighter also made the cut. Makeup artist Carola Gonzalez told Refinery29, "I see glitter being layered over eyeshadows and primary-color eyeliners, used as an eyeliner, or on its own all over the eyelid — there are so many options and so much you can do." If you were never quite able to master the heavily structured brows that were ever so popular in 2017 and 2018, you're in luck. Makeup artist Natalie Kate told The List that "the 'Instagram' structured bold brow [is] quickly disappearing." Taking their place are "bushy natural brows." Hallelujah! "Clear brow gels and even soap for brows have taken the beauty industry by storm for this year, and the messier the better," the expert explained. "Brushing hairs up and creating more shape and volume to the brow is going to be huge for 2019!" If you're curious to try brow soap in 2019, you should know it's literally just a bar of glycerin-based soap. No fancy schmancy soap required. Celebrity makeup artist and groomer Joanna Simkin revealed to Domino, "I do soap brows because honestly, no brow gel works as well as the soap to hold the brows up," adding, "Soap brows will last you all day, guaranteed." If you're looking for ways to change up your makeup regimen in a big way, cinematic makeup artist Ulla Gaudin revealed just the trend you'll want to try. "We will be seeing lots of one color eye shadow blocks and unique, colorful eyeliners," she explained to The List. 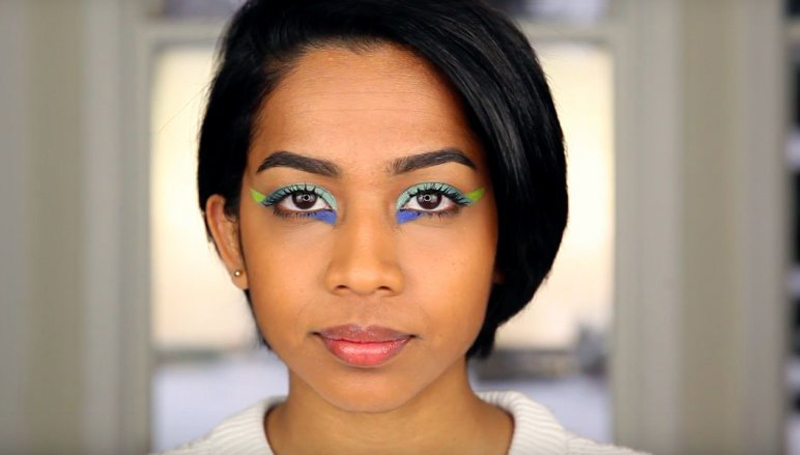 This trend has been dubbed "geometric eye makeup" — and it's exactly what it sounds like. This look can even be combined with another popular trend, glitter eyeshadow, which will work to create the ultimate 2019 mood. With this trend being so very bold, you might expect it to be paired with equally dramatic, long lashes. As it happens though, that would only detract from the fun shapes and lines you've worked so hard to create. Gaudin explained, saying, "Big lashes will be going away, and the geometric shadow is paired more with natural lashes or smaller extensions [or] fake lashes." One of the fun things about geometric eye makeup is how customizable it is — especially when it comes to eyeliner. "We haven't seen this much creativity with liner since the '60s and I am so excited about it," celebrity makeup artist Mary Irwin gushed to The List. If you've been sticking to black liner for some time, 2019 may just be the year to get out of your comfort zone and try some colorful varieties. From "bright liner" to "full on multi-layered colored liner," Irwin says "the possibilities are endless." Even if you don't want to try out geometric eyes, you can still embrace the colorful trend. In addition to liners, you can try out plenty of shadows. 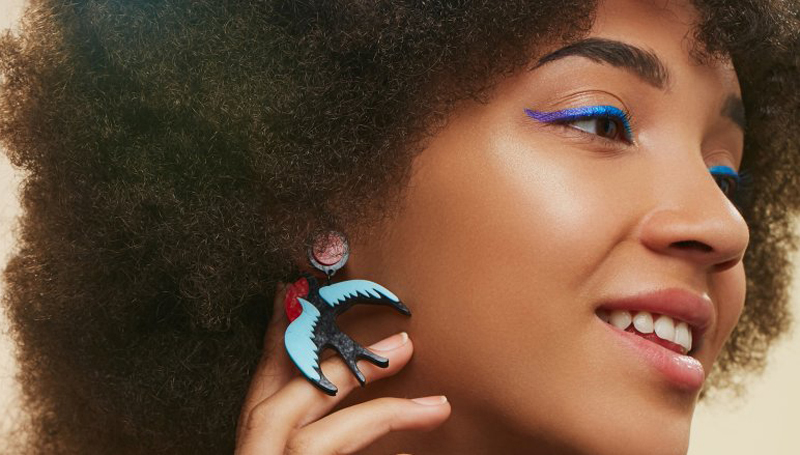 The makeup artist expects bright-colored, jewel-toned, and even neon eyeshadows to be a huge trend throughout the 2019 year. Of course, you don't have to try them all at once. "A simple wash of color across the lid" will do just fine, according to the beauty expert. If you're wondering how in the world matte finishes could be making a comeback at the same time as glass skin, we hear you. It does sound confusing. But here's the deal: cinematic makeup artist Ulla Gaudin said the matte look of 2019 is immensely different than that of the 1990s. "Skin will be polished and sort of dewy but without the crazy highlights it'll look more matte," she revealed. With this modernized matte finish, you won't have to worry about your skin looking dull. Whether you choose to go the more matte route or want to try out its very, very dewy cousin, glass skin, you really can't go wrong. 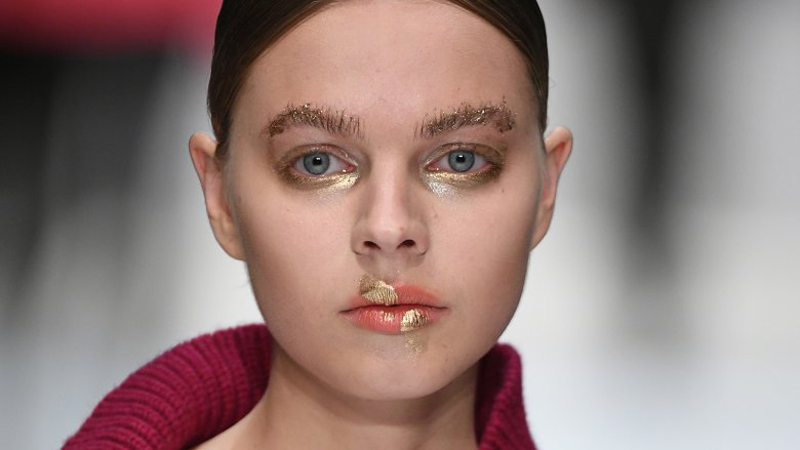 The makeup artist told The List, "Super soft, beautiful skin is the way to go in 2019!" With hyaluronic acid being a popular ingredient and barely-there foundations being all the rage, it's a good time to try out the radiant skin trend. Winged eyeliner can be daunting, but it should be at least a little easier throughout 2019. Makeup artist, airbrush specialist, and owner of Beauty Asylum in North Carolina, Jessica Kendall told The List that she expects the "cat eye flick" to be a top trend. Although it's similar to the original cat eye look, Kendall explained how to perfect the technique, saying, "Stay away from the over exaggerated wing and focus on a little flick at the end of your eye liner." Why? "The upward lift will put emphasis on opening the eye," the expert revealed. The cat eye flick — or the feline flick, as it is also called — is so appealing, in part, because of its versatility. Renowned makeup artist Charlotte Tilbury said this trend will work on everyone. "It gives you an eye lift, it adds intensity to the eye, it elongates the eyes," she said, listing off just some of the benefits. Well, color us impressed!